The Cake of the Desert is a short graphic novel about two characters who stray into the desert as one of them attempts to recover lost memories of a bygone New Year's Eve. The text is closely based on the transcript of a 1994 Plaintext Players performance I directed (the 9th episode in the "Christmas" series). 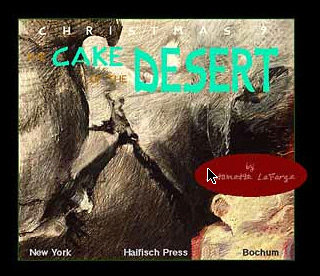 Although The Cake of the Desert uses a wide range of visual imagery, it experiments with the conventions of its genre by not using stable pictorial representations of the characters. Instead, characters are distinguished from one another mainly through the color and position of their speech balloons. As part of my work on The Cake of the Desert, I designed two fonts for the text. The book's title font is Vilhelm, named in honor of Richard Wilhelm, the great 20th century translator of the I Ching. The other is Forger, a font based on my own handwriting in acknowledgment of the tradition of hand lettering of cartoons, comic books, and graphic novels. The Cake of the Desert was included in the "Out of Context" show at Robert V. Fullerton Art Museum (San Bernardino, CA, 2000) and the "Energy" show at Visual Arts Gallery (New York, 1995). Published by Haifisch Press (1995).